HCM CITY — The Việt Nam History Museum in HCM City has opened the Nét Cũ Dấu Xưa (Marks of History) exhibition, showcasing 130 Vietnamese artefacts from the 15th to 20th century. 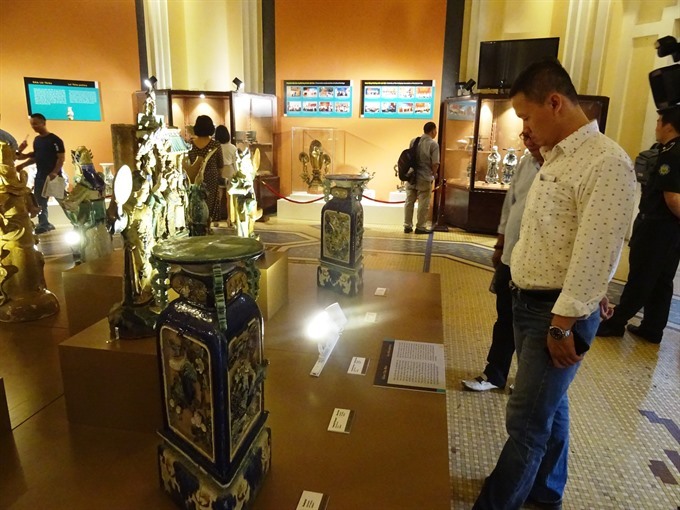 The pieces are from the collections of 27 members of the HCM City Antiques Association and from the museum. “It also shows their knowledge, understanding and love of Vietnamese culture and fine arts,” said Tuấn. The exhibition displays items made from stone, metal and ceramics. The collection is composed of Cây Mai ceramics, a famous ceramic genre in the South created by artisans in HCM City’s Chợ Lớn at the end of the 19th century and the beginning of 20th century. Cây Mai ceramics are dedicated to Buddhism, with statues of dragons, phoenixes and kylins, as well as glazed ceramics vases in varying shades, including green, white and brown. The statues and vases were used in pagodas and temples. The exhibition also showcases swords, seals, tea sets and household goods used during the Nguyễn Dynasty (1802-1945). Various administrative and royal documents from the Nguyễn Dynasty are on display as well. “We decided to introduce our collections to local and foreign visitors so they can learn more about our history,” said Quỳnh.